Gas prices Monday: A far cry from $3 or $4 a gallon. We are enjoying the lowest fuel prices in years, as everyone knows. It’s a huge help to consumers, who now have more money to spend on other things, or even to save. But some people hate it. Why do some hate it? For one thing it proves them wrong. For another, it undermines their campaign to get us to drive electric cars if we insist on driving at all. Only a few years ago, self-appointed greens ridiculed conservatives who, in the face of gas prices around $4 a gallon, argued for more drilling. More drilling in this country would never bring back cheap gas, they said. After all, they scoffed, the price depends largely on the world price of oil. As it turned out, the boom in more drilling in Texas and North Dakota — along with a slowdown in demand in Asia and Europe — has indeed had a big effect on the price. An energy analyst on one European online news program predicted Monday that the downward pressure on the price of oil could last for years, and he credited largely the increased production in America. In Oregon, meanwhile, we have just re-elected a governor and increased the majorities of Democratic legislators who all want to do all they can to discourage us from using fossil fuels. For that, they need traditional energy sources to cost more, not less. 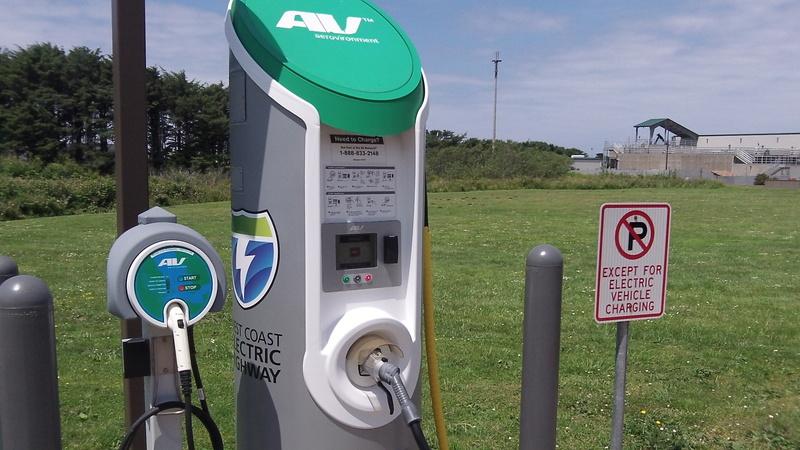 A lonely charging station at the coast last summer. Tell ya what Ray- You can DONATE YOUR money to the City if you feel it really needs it. 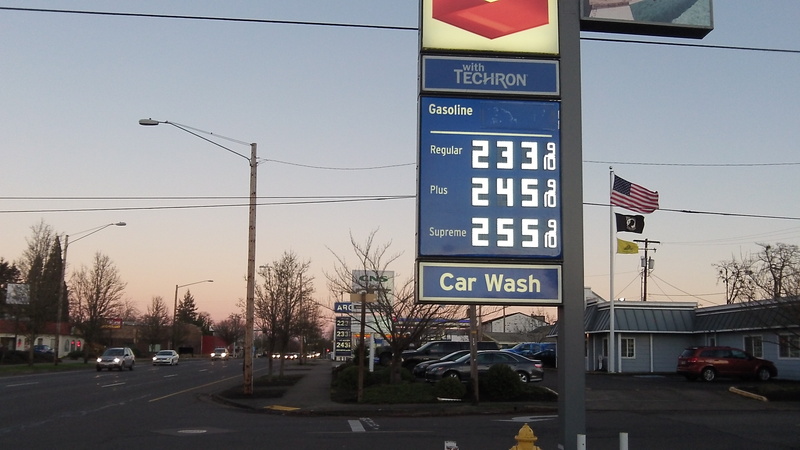 Just because gasoline prices are starting to reach the level they SHOULD be, doesn’t mean it’s inexpensive. That’s going to be the political ploy– Since gas prices are low a little extra tax won’t bother anybody. Would they ever remove that little extra tax when prices go up? We know the answer to that! Think of how much more driving people would do with lower prices. That’s going to result in greater tax revenues. SIMPLE! Instead of our various levels of govt. trying to punish gasoline purchasers, they should embrace them and make it as affordable as possible. Not sure why this is not common knowledge: OPEC nations are allowing oil prices drop in order to spite Russia and send its economy into recession. They view Putin as a big bully (see Ukraine) and want to teach him a lesson even if it means temporarily giving-up some of their profits. Think about it. Nobody has mentioned increased domestic oil production and capability. This in addition to OPEC’s tactics. There is a glut of oil on the world market and OPEC does not control the price of oil to the degree it has in the past for just this reason. However, politicians will no doubt try to exploit this drop in the price of oil to raise taxes instead of allowing us to keep more of our income for spending how we see fit and thus spurring on this economy that seems to be doing well on Wall Street, but not so much on Main Street. This economy is not improving as much as the liberal media leads us to believe.